Hi, may I know where you are based? I am a TV writer doing some research on Chinese opera in Singapore and would like to get in touch with you to find out more about your music collections. Couldn’t find your email address on the site. Hope to get in touch with you. Thanks! Just a small correction regarding the provenance of this record: “Pagoda” is not a German “Deutsche Grammophon” product, but a sublabel of the British “His Master’s Voice” company, pressed at their factory in India. From a collector’s and discographer’s standpoint, I would appreciate very much if you could list the various numbers embossed in the blank space around the label – they often give important clues about when and where a recording was made. Thank you! I’ve been meaning to respond to the comment about Pagoda for some time. After consulting my own collection and with help from Haji Maji and information from his collection, we pooled our information together and it seems clear that Pagoda was for a large portion of its muddy existence a Deutsche-Grammophon product, and related to HMV for an unknown period of time (years? months? ), though even then the relationship is confusing. I will break this down below. My collection of Pagodas is strictly Malay music and ranges from numbers V3610 to V3896 and all have “Made in Germany” stamped in the dead wax as well as “Mechan. Copt. 19XX” numbers stamped as well. V3610 is from 1930, while V3896 is from 1938. V3666 is from 1935! The later numbers all have “Manufactured by Deutche-Grammophon A-G” written on the label, near the bottom. Here’s where things get interesting [please correct me if I have anything wrong, Dave]. Haji Maji’s collection of Pagoda records featuring Chinese opera starts with V3160 and says “Manufactured by Deutsche Grammophon G.M.B.M Hannover” on the label. There is no copyright date on that, which would indicate it’s from pre-January of 1927, when the “Mechan. Copt.” dates began to be stamped on D.G. releases. He also has V3874, which is clearly an Indian Gramophone pressing with matrices CEI 15587/88 and the giveaway “G” stamped in the wax at the equator. He then has V3976, where the label and pressing are back to being German again, from D.G. Then, once again AFTER that number, the releases go back to being from HMV. There are many unknowns, of course, regarding Pagoda. Hopefully others can chime in with more detail. Though the main point is that Pagoda certainly was a D.G. product for part of its existence, we don’t know how for long, exactly – certainly an educated guess would suggest it was a D.G. product for a generous portion of the 1930s. However, we also do not know if the D.G. records were released anytime near their stamped copywritten dates. One would assume so. We also do not know when Pagoda had a deal with HMV, or for how long, or why. 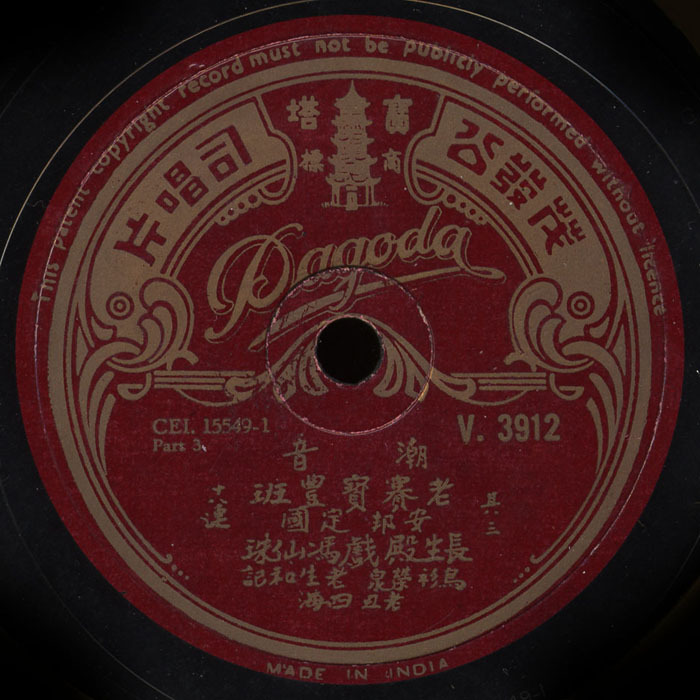 We don’t know if Pagoda got the rights to release some previously recorded HMV product – Teochew opera, for instance – on their label, which appears to have been distributed only in Southeastern China and Malaysia. Perhaps Pagoda had two deals concurrently – one with D.G. and one with HMV! At any rate, mysteries abound, but most assuredly Pagoda had a strong German connection. Thanks for getting me to dig out those records JW! I want to know if anyone has info regarding Mong Huat and Co.??? ?